Demetra George is a professional astrologer who received her Masters degree in Classics from the University of Oregon. She has been active in astrology since 1971, and in 2002 she received the renowned Regulus Award in Theory and Understanding. Demetra draws upon her background in mythology and ancient languages to create a unique synthesis of archetypal astrology and ancient techniques, along with travel to sacred sites. She is the director of Thema: Foundations in Astrology. Demetra offers mentoring in fundamentals of interpretation, chart delineation, Hellenistic astrology, mythic asteroids, and ancient Greek for astrologers. Learn more. 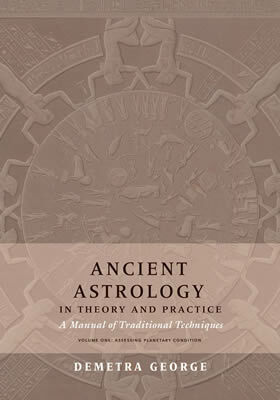 I am so happy that Ancient Astrology in Theory and Practice: A Manual of Traditional Techniques (Volume One) is now released. A blessed New Year’s gift to me. It has taken many years to distill these teachings of our ancient astrological wisdom tradition and I thank my teachers, students, colleagues, and editor Dr. Aaron Cheak who participated with me in this process. You can order the book here.